WELCOME TO THE NEW SYNERGY MASTERCLASSES! EAHP is glad to announce the expansion of the Synergy programme to provide continuing education and further advance the hospital pharmacy profession throughout the world. The Synergy Masterclasses have arrived! Accredited by ACPE and focused on the most ground-breaking topics and topics most needed by hospital pharmacists and healthcare professionals, this programme is effectively a one or two-day mini congress. 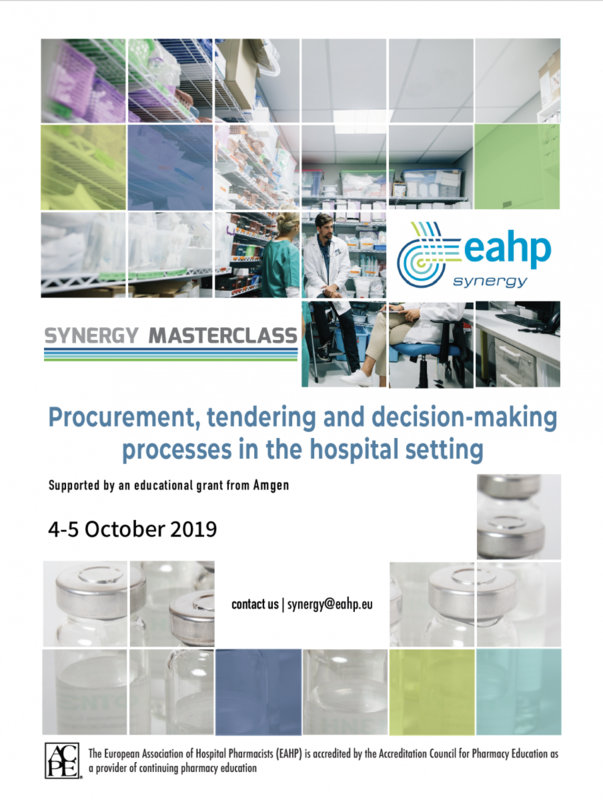 The second Synergy Masterclass will focus on "Procurement, tendering and decision-making processes in the hospital setting" and will take place on 4-5 October 2019 in Brussels, sponsored by an educational grant from Amgen.